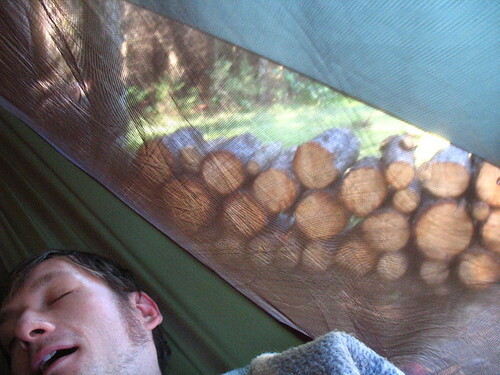 This is me waking up in my first ever camping hammock. I’ve tried it out every night for the past week. It’s a green nylon hammock enclosed with mosquito netting on the top. So basically I sleep in a giant cocoon. Above that (at top right here) is a rain fly. There are some drawbacks. It can get cold in there if the night is cool. Blankets don’t help, at least not inside the cocoon. If you can hang a blanket snugly on the outside of the hammock it will help insulate. Learning how to rig up the blanket has been an interesting process. I had some rough nights, but I think I figured it out. For those interested the brand is Hennessy Hammock. The design is ingenious and super comfortable. I hear that ENO makes some great ones too, but theirs clock in a little heavier and cost more. The camping hammock is one of the best engineered pieces of equipment I’ve ever dealt with. I love climbing in and falling asleep in the breeze. It truly is sleeping in the sky. This is a piece of equipment I never could have bought if it weren’t for my wonderful donors. Everyone who made a gift, whether $10 or $100, thank you. 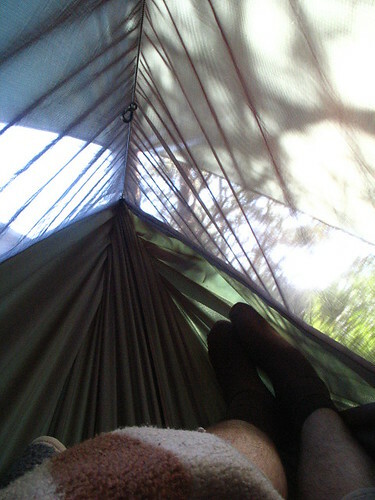 The entire hammock and rain fly fold up to 6×11″ and weigh less than 3 pounds. I compared this to my old one-man tent today. When stowed it’s nearly 3 feet long and weighs at least twice that much. Seeing you in it = Priceless! I just bought one of these (pretty sure the exact same model). It was the bottom-entrance that sold me on it. Haven’t put mine up yet but glad to see it got your nod. PS regarding the cold nights: did you try sleeping on top of a blanket, and having another on top of you? I gather that’s how it’s “supposed to be done,” but haven’t tried it yet myself (obviously). I’ve wanted a hammock for just using in the yard, but there are just too many deer flies, black-flies etc around here to make it practical. Never heard of these enclosed camping hammocks before, but one would be the perfect solution.